Phew! Never have I felt so grateful for a Grace Day -the extra day after a Bank Holiday that my work gives us off. 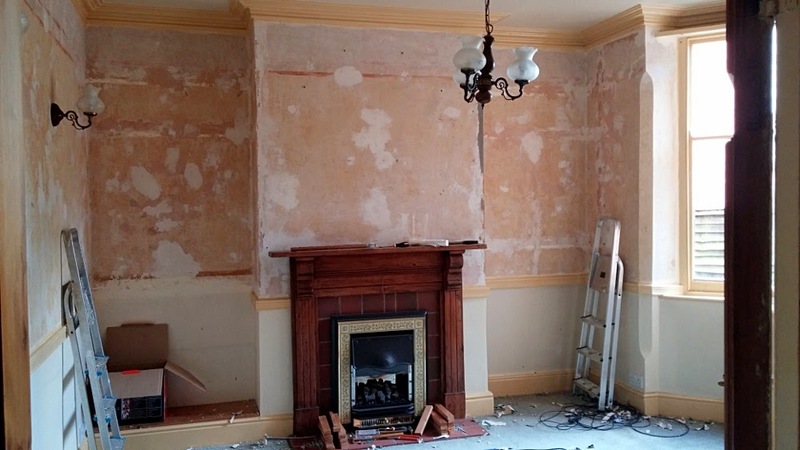 We've spent the last three days working really hard to strip back our rather oppressive dining room, so we can start the fun part...decorating!!! 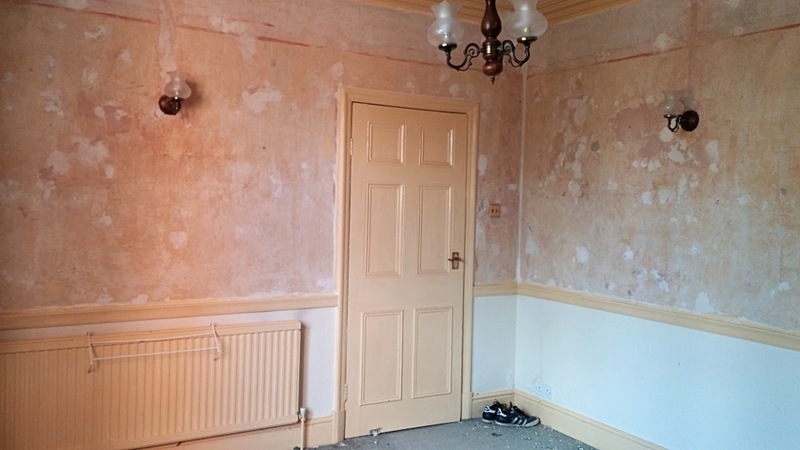 This means I've done zero sewing and it also has absolutely nothing to do with stitching, but I promised you guys I'd share progress on the house front after you showed such an interest in our living room renovations (in progress here and revealed here). 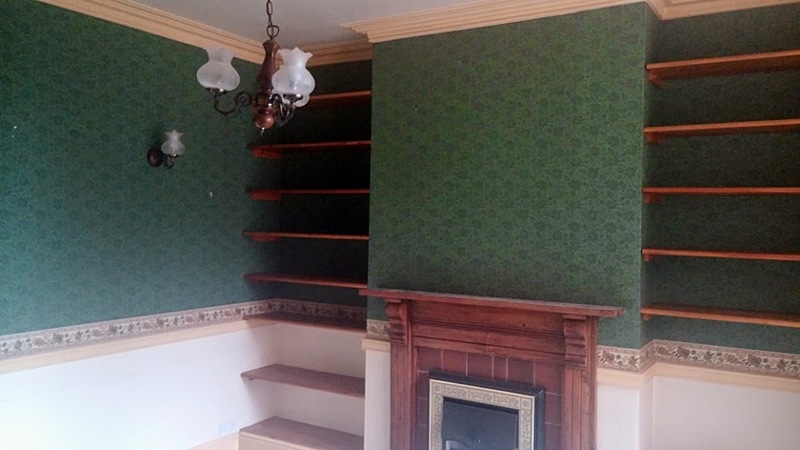 Our dining room faces the North/East and doesn't get much direct sunlight, so why the previous owner decided to wallpaper it such a dark colour is totally beyond me!?! The dark green made it feel oppressive and it also had some hideously yellow/sick-coloured accents. Just eeeeew! So, we got busy on days one and two removing the shelves and wall lights, perforating the wallpaper, steaming and stripping it, sanding the walls, filling in any imperfections (note all the white patches on the walls) and sanding them down again, whitewashing the walls, removing the door all ready for professional stripping, and finally painting the ceiling and ceiling rose. On day three we decided to be brave and see what lurked beneath the tired carpet and we weren't disappointed! 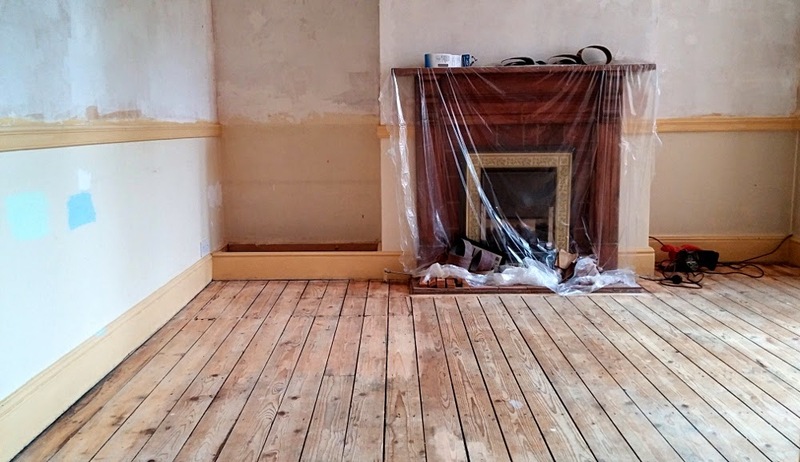 We discovered a handsome set of floorboards, but not before having to rip out the carpet and underlay, prize off the gripper strips that were nailed to the entire perimeter of the room and wrestle with an excessive number of tacks which were holding down some random wires. 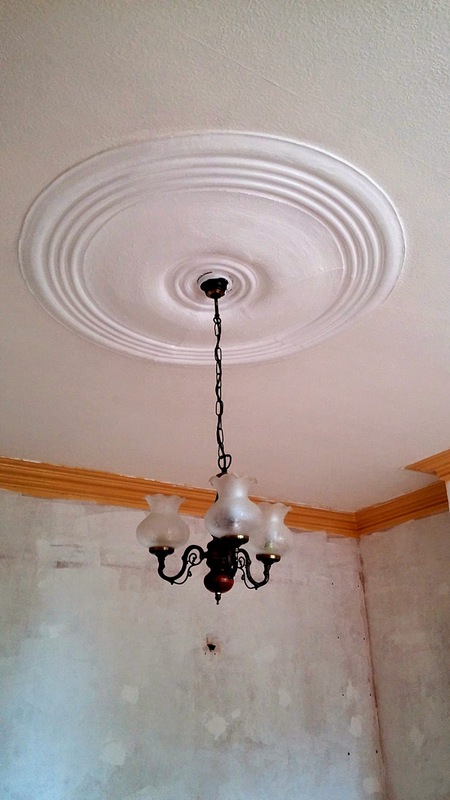 We're loving our blank canvas so far and have loads of ideas of how to decorate it in our much loved modern, yet retro aesthetic - you can check out my Pinterest board to see what we're digging! 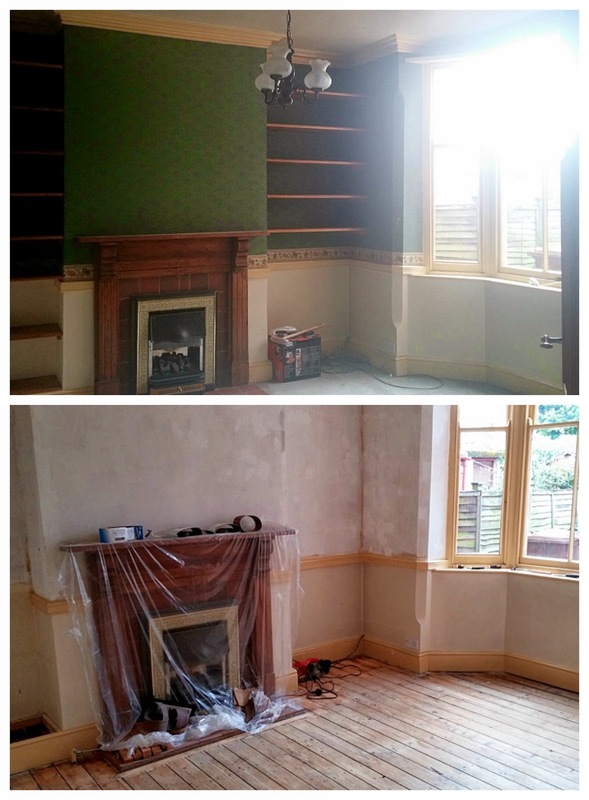 So there you have it...we've finally got our decorating mojo back just seven months after moving in! Inevitably, this will mean a drop in my stitching productivity, but I do have a second Lilou Dress to show you as soon as I get my nasty rash thing under control (check it out here and here if you're brave enough!). What's been keeping you busy lately? 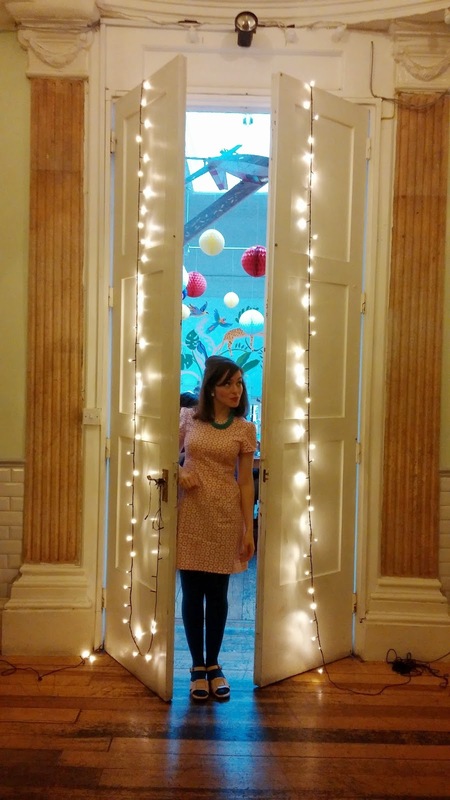 You caught a cheeky little glimpse of her at Tilly's book launch and I'm now excited to show her off in full! 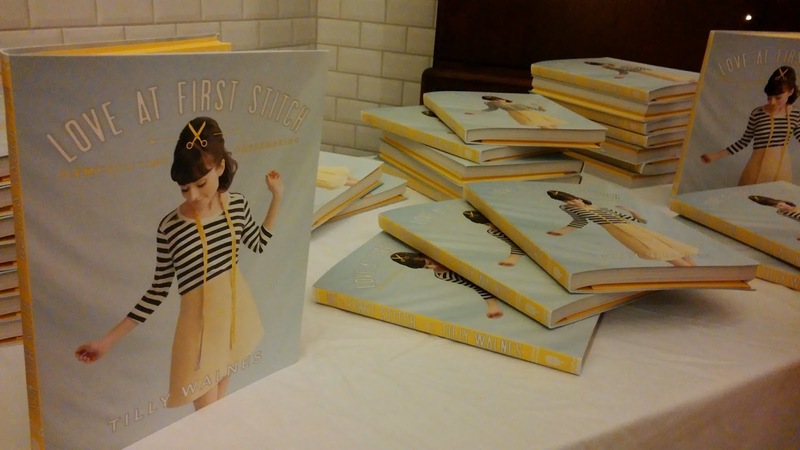 I'm talking about my Lilou Dress of course, which is arguably the most advanced pattern of the seven featured in Love at First Stitch. The Lilou Dress is only advanced in comparison to the other patterns in the book, so please don't let this description put you off! It's actually a very simple dress to stitch together, made super easy by Tilly's crystal clear instructions and illustrations. In case you're wondering, I stitched mine up in a straight Size 3, but decreased my seam allowances to 1cm from the armhole to the bust dart. Call me lazy if you want, but it got me out of an FBA situation so ner, ner, ner, ner, nerrrrrrr! The original pattern is for a round-neck bodice and a pleated skirt, but Tilly includes variations for a scalloped neckline and a gathered skirt - ensuring that this is a highly versatile little frock. For my first Lilou (a second is already in the pipeline) I opted for the scalloped neckline and pleated skirt, a combo I truly adore! My scallops are fairly shallow and fluid, but because Tilly gives you the tools to draft them yourself, you have the power to design them exactly how you want to! The instructions don't require any topstitching, but I opted to do so for my neckline and armholes as I couldn't bear the thought of unsightly lining peeking out! I decreased my stitch length to better navigate the curves and I don't think it detracts from the overall effect, so I'm pretty happy with the finish. The bodice is lined in the same clever way I recently discovered with my Emery Dress, but it's still not my favourite method. This time I took steps to avoid the lining getting caught in the zip, like not stitching it too closely to the zip and aggressively pressing it with the iron. This seems to have worked a tad better at least and it sure does looks neat. Other than the sweet scalloped neckline, I really love the pleated skirt! More specifically, I'm a huge fan of the pleat placement. Instead of going all the way round, the pleats are only placed off-centre, eliminating unwanted bulk from the tummy area. I find that even gathered skirts can sometimes be unflattering around the tummy area, so this style is a great compromise. I know by this point you're probably dying to know more about my chintzy, floral fabric. Am I right? I'm afraid I'm going to disappoint you if you want some for yourself, because it's an old pair of curtains from a local charity shop - the St Michael brand was ditched for Marks & Spencer back in 2000, but the quality of this medium-weight cotton is so lovely! 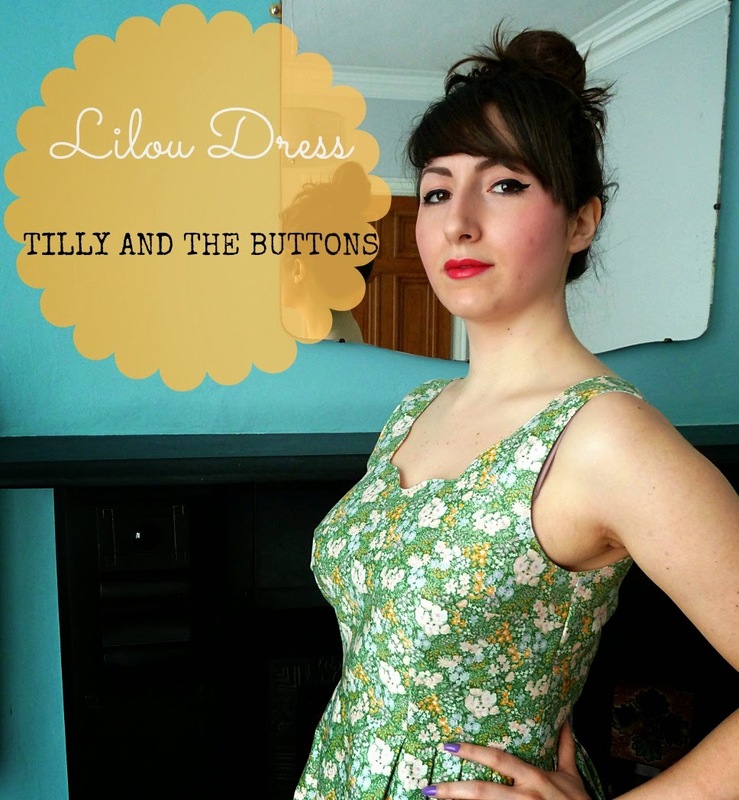 Are you as much of a fan of Tilly's Lilou Dress as I am? Which version would you make? Hi friends, what are you working on at the moment? I've been feeling the pressure lately with mounting WIPs and a stitching wishlist as long as my arm! I've also been a busy little Craftsy blogging bee lately, taking on a bonus post to help the team out during a tricky week. If you're interested at all check out How to Design a Skirt Pattern Using a Self-Drafted Block and Double Trouble: How to Thread a Double Needle. Apologies for the short promotional post today, but I do have my Tilly and the Buttons' Lilou Dress to share with you very soon! Following on from yesterday's post, today I'm actually sharing a glimpse of Love at First Stitch - the debut title from everyone's favourite, pint-sized powerhouse known as Tilly and the Buttons. What immediately strikes you when first leafing through the book is just how beautiful it is - it has a very fresh and modern aesthetic with a definitive nod to Tilly's signature retro, 60s style. You'll be relieved to know that it's definitely not just a case of style over substance though. This book is also packed with a wealth of helpful information and advice, as well as step-by-step techniques that are guaranteed to help you 'up' your sewing game. Tilly expertly and meticulously takes you through each step of every project, with clear instructions and even clearer photographs. Despite designing her book predominantly with beginners in mind, she has a great knack for not dumbing down, making this the perfect companion for stitchers of all abilities. There are seven different patterns to delight you, and unlike similar books for beginners, you'll be pleased to know that there's not a single cushion cover or laundry bag in sight. That's right, seven patterns solely for your selfish stitching pleasure!!! The patterns are classic and simple, lending themselves nicely to 'wardrobe staple' status, yet each have a number of additional variations to help you get the most out of them and express your own unique sense of style. The full-scale patterns are in a handy envelope at the back of the book. You will have to trace them off though as they're overlapped - something I personally dread having to do as I'm SO lazy - but it's a truly small price to pay all things considered! Aside from the adorably versatile patterns, I absolutely love the 'Make it a Lifestyle' sections running throughout the book, offering tips on creating an inspiring sewing space, fitting sewing into a busy life, becoming confident in dressing handmade and so much more. Tilly's conviction and passion about stitching becoming a lifestyle choice is inspiring and rather contagious. Wednesday 7 May - Did you make that? You can get a signed copy of the book directly from Tilly and the Buttons, order a copy from Amazon, or if you're quick, get a free copy when you subscribe to Love Sewing magazine! 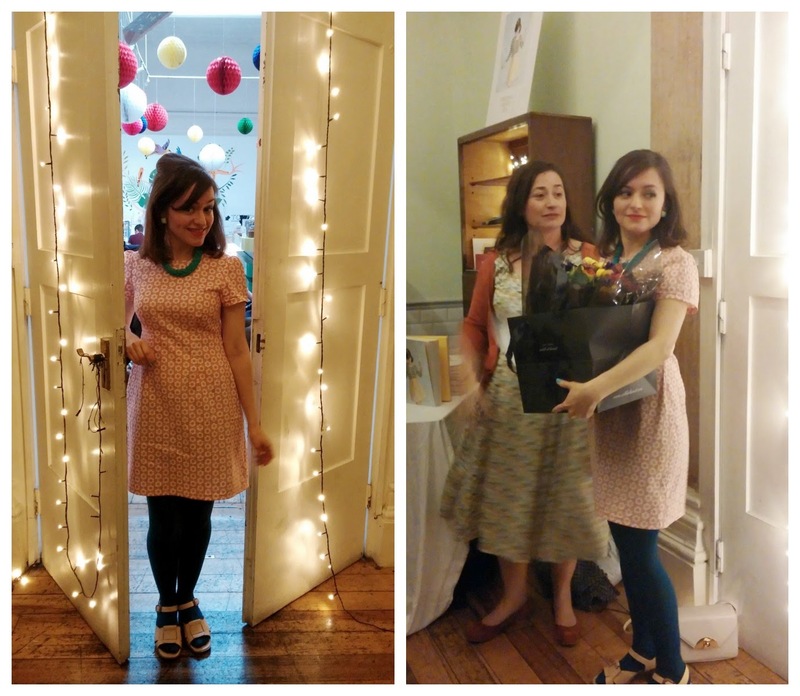 Last night I was very privileged to attend the launch of Love at First Stitch, the widely anticipated debut book from Tilly and the Buttons. 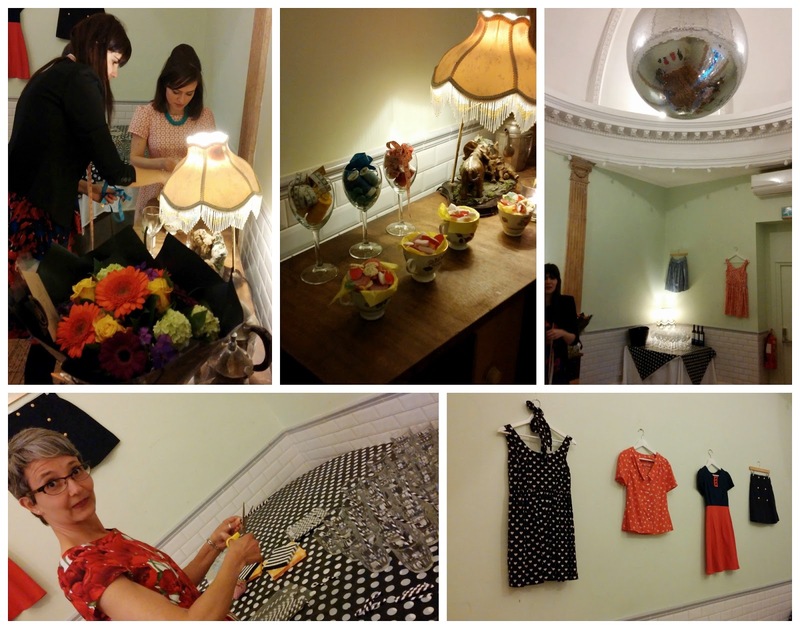 It's been such a joy seeing a fellow stitching blogger skillfully grow her passion into a fabulous business, so having the chance to share Tilly's special night was a real honour! 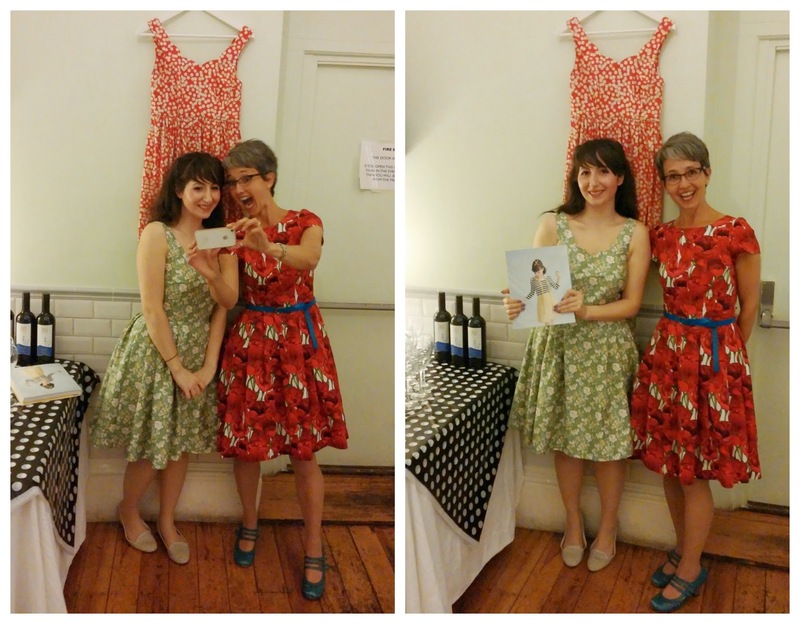 I'll be addressing the book itself in a full review tomorrow as part of Love Sewing's blog tour, so for now I just wanted to share some pretty pictures from last night's shindig at Drink, Shop & Do. 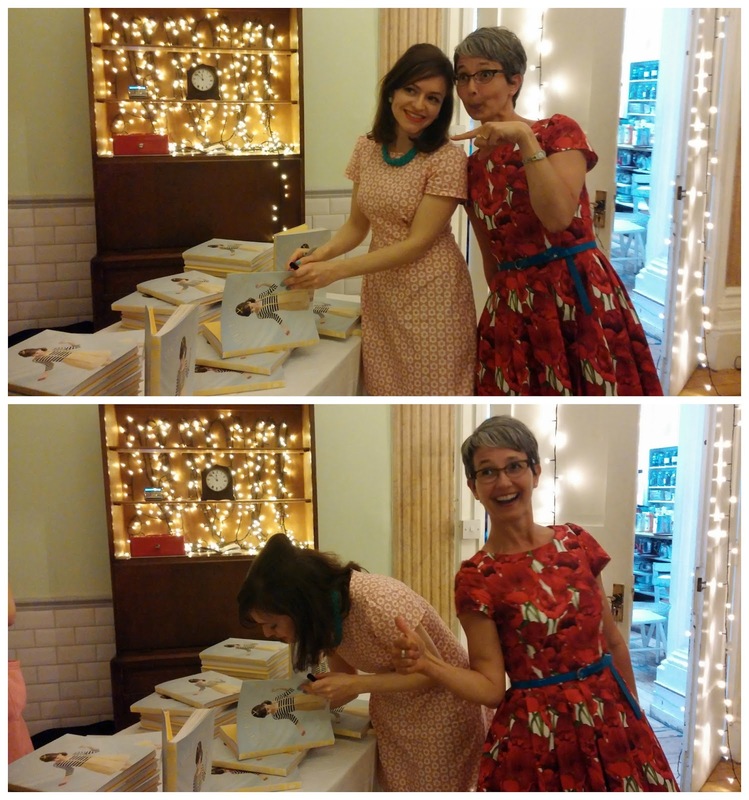 Once the decorating was done, a lot of larking around ensued! I was wearing my new, scalloped neckline Lilou - full post coming soon! 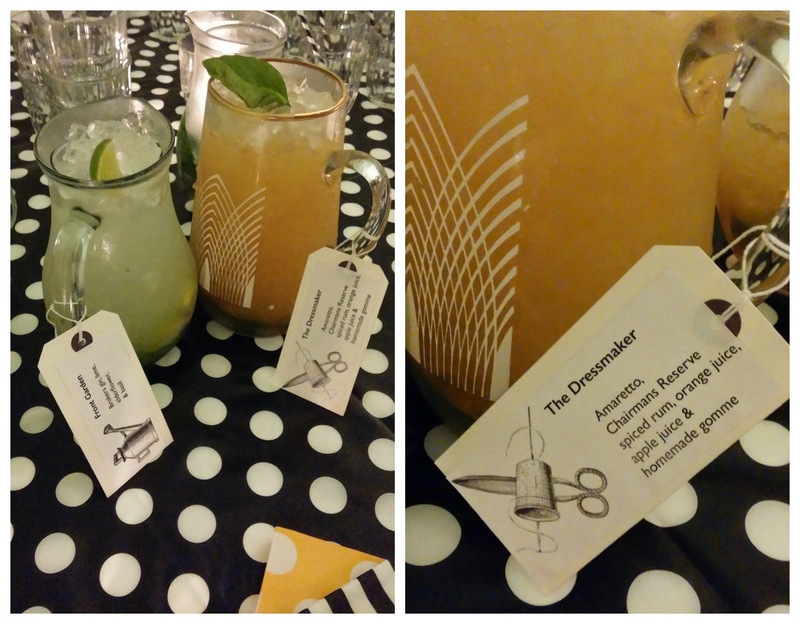 Cocktails were consumed, but can you guess which one went down the best?!? So many gorgeous, hand-stitched garments in one room! 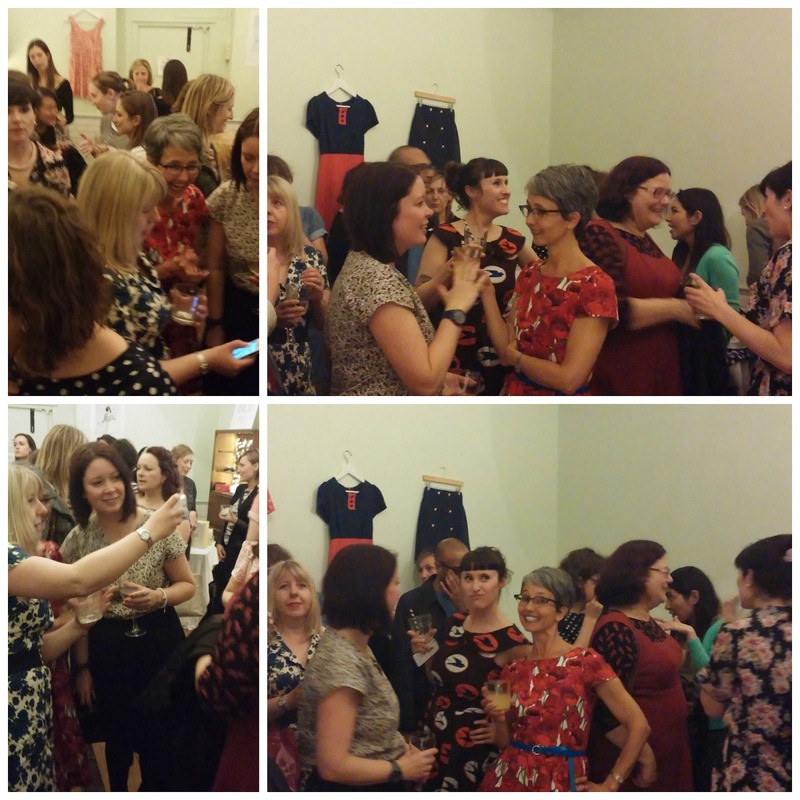 Can you spot any of your favourite bloggers among the crowds? And the talented lady herself of course! Massive congratulations Tilly, you're a true inspiration! 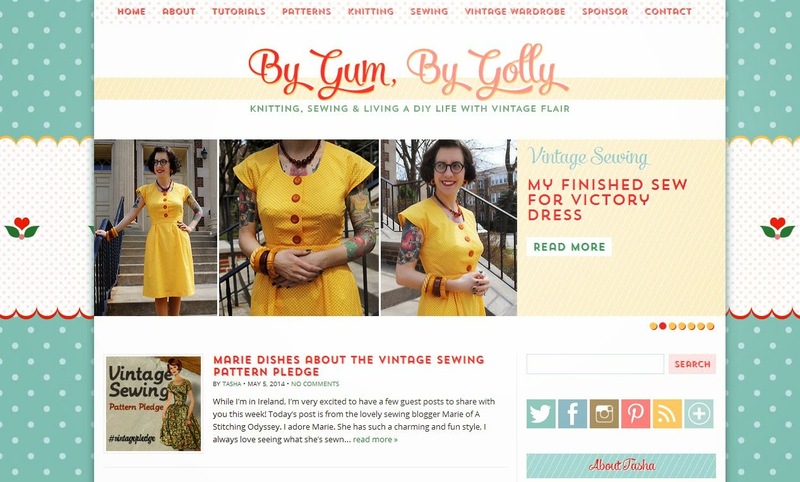 Friends, I'm so giddy about today's guest post from Tasha over at By Gum, By Golly! 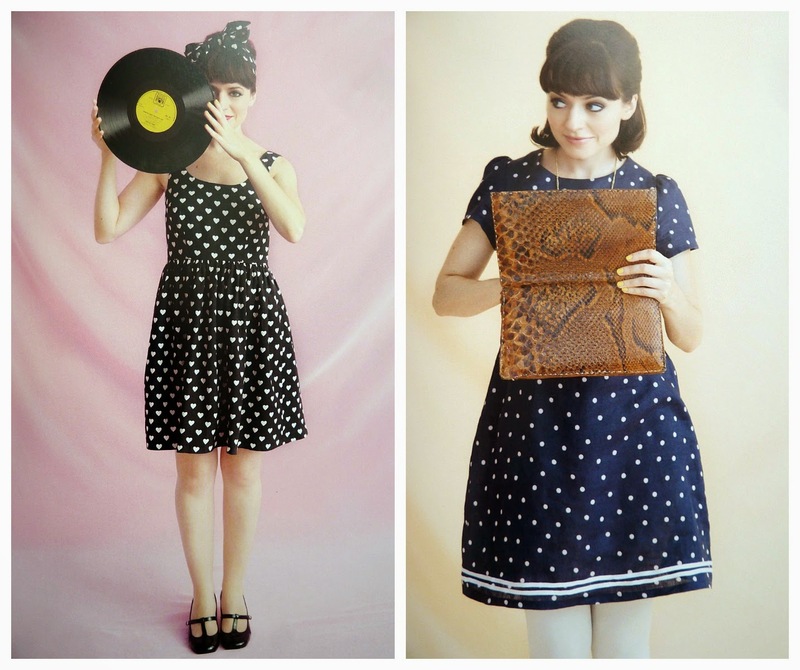 Tasha is a self-confessed vintage obsessional, with a passion for sewing and knitting her way through styles of the 40s and 50s. She's also released her own vintage-inspired knitting patterns and shares updates on turning her 1955 brick ranch into a retro paradise. 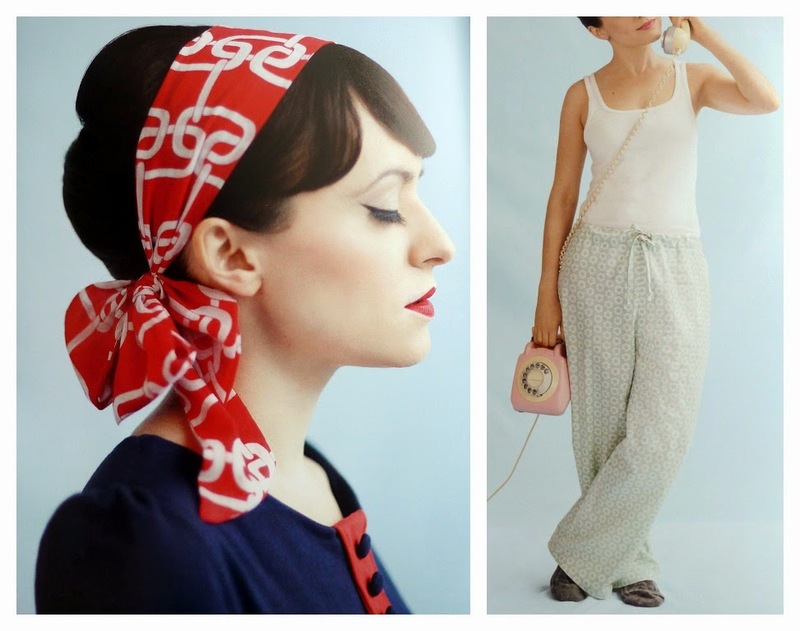 To have her support for my Vintage Sewing Pattern Pledge is a dream come true...over to you Tasha! Hi everyone, I'm Tasha from By Gum, By Golly. 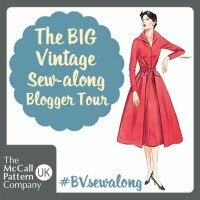 I was tickled pink when Marie asked me to guest blog for her about vintage sewing. I think she's just the bees knees! Marie's Vintage Sewing Pattern Pledge is a fabulous idea, and I've loved seeing projects cropping up all over. 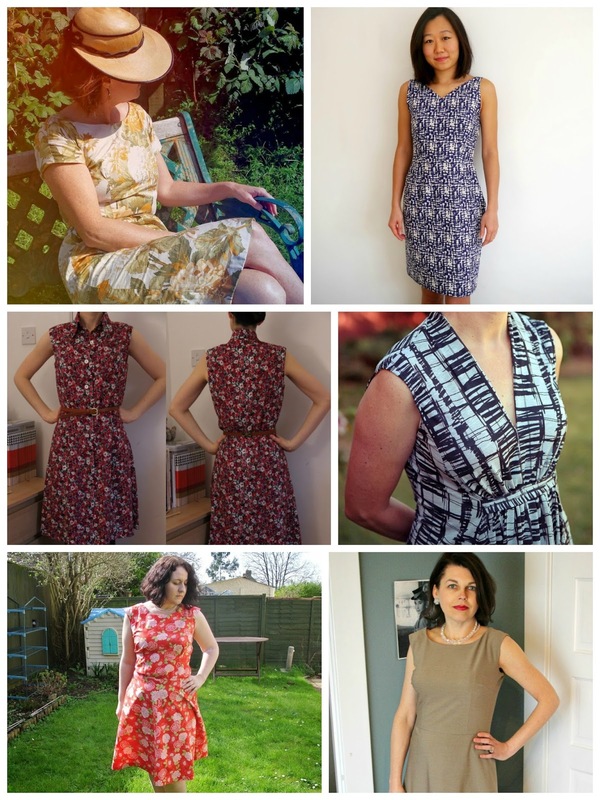 I do a lot of garment sewing, and a large percentage of the patterns I use are vintage, primarily from the 1940s and 1950s (although I absolutely love supporting indie designers too!). 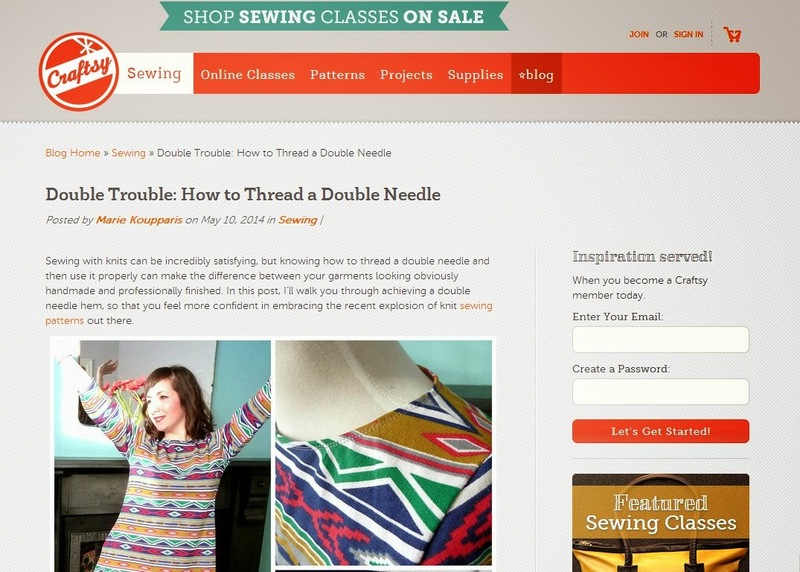 Originally, I came to sewing in general as a way to supplement my wardrobe. I grew up crafty in a family full of crafty women, I was already knitting like a fiend at the time, so why not sew, too? 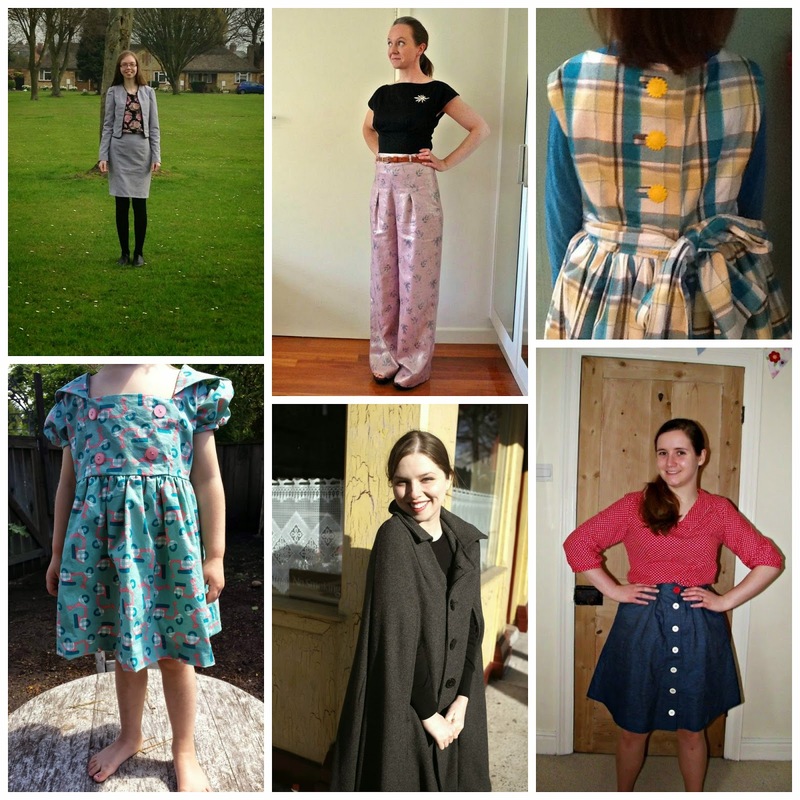 Considering affordable vintage clothing in the eras I prefer will only get more and more difficult to find, it seemed like a great idea to take up sewing some of my own clothes. And because my aesthetic is vintage already, that meant I plunged head first into vintage sewing. I wore vintage, so naturally I wanted to sew vintage. 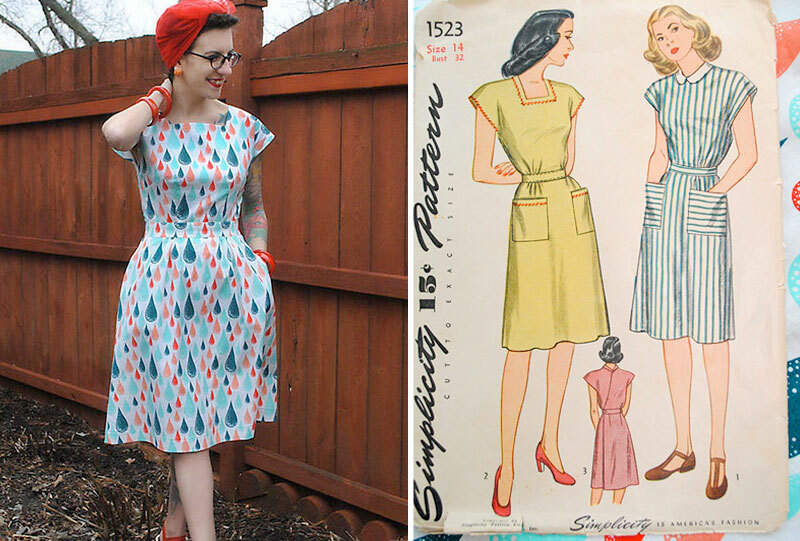 It never really even occurred to me that I should be nervous or scared of vintage patterns! Of course, I was passing by the ornate and beautiful gowns of the late 40s and 50s, and turning to the day-to-day, casual frocks, tops and blouses. 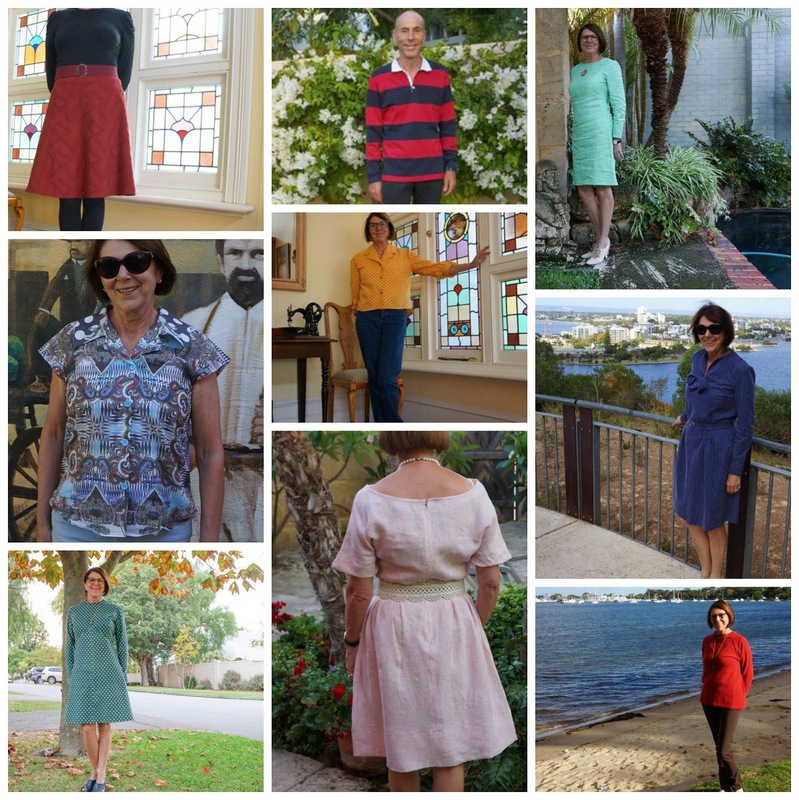 I like to think I have kind of a carefree, casual and fun style, and so that's how I sew, too! 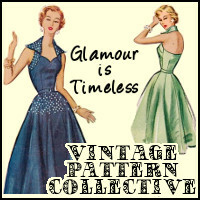 I love vintage patterns first and foremost because, well, I love vintage, period! But there's so much more to it than that. It's a great connection to the past. When you hold a 60 year old sewing pattern in your hand that has little scribbles on it and pin marks, you wonder, "Who made this before me? What happened to the garment? How did she embellish it and make it her own??" It's such a neat feeling to know you're carrying on the tradition of generations before us, all in a few pieces of old paper and tissue! Even if you don't wear vintage styles on a daily basis, who could resist some of the adorable garments found in vintage patterns, along with killer artwork on the envelopes? That's one of my favorite bits. 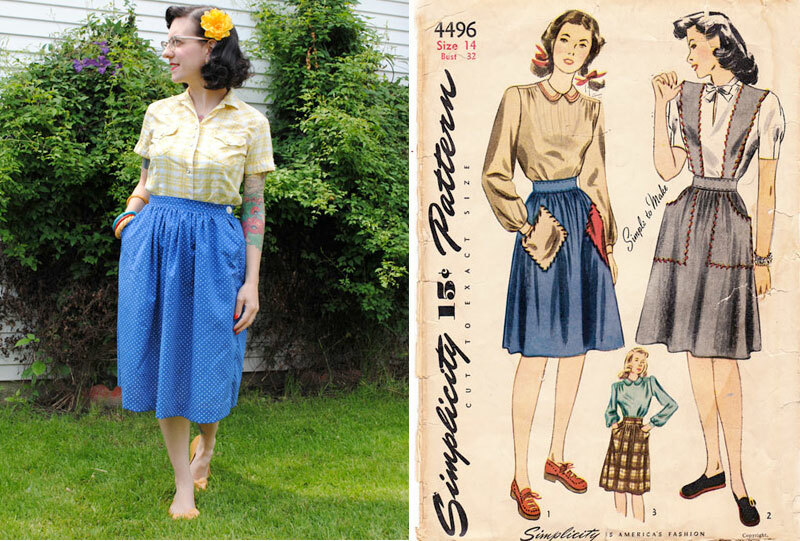 There are soooo many different kinds of vintage patterns across many decades! 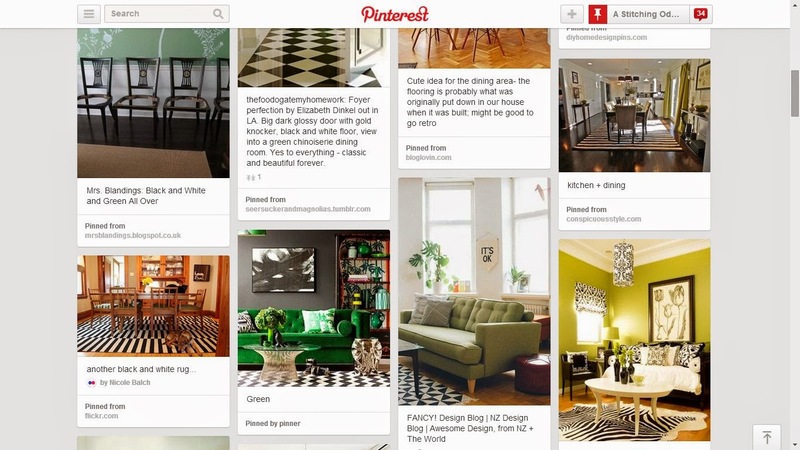 No matter what your aesthetic is, you're sure to find something you like. 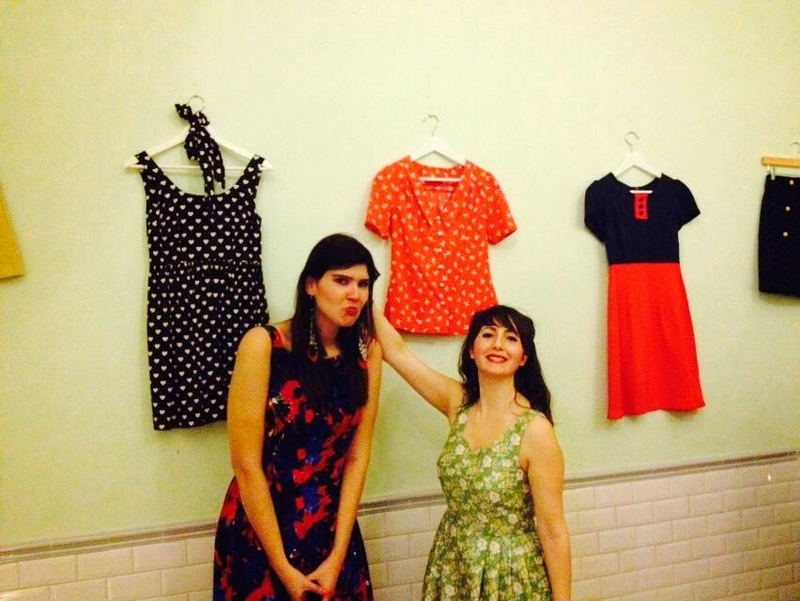 And use your imagination to see how a vintage pattern might work in your wardrobe! While I may personally dress with a vintage slant, there are lots of vintage patterns that, sewn up, can slip right into a modern wardrobe! Just use your imagination. That's one of the most fun parts about sewing anyway, right? Taking a basic pattern and turning it into your own creation. Below I've paired a classic 40s pattern with a modern novelty print cotton. I love the unexpected! And if you're unsure, test the waters with a wardrobe staple. Who can't use a 4-gore skirt? Go just below the knee for a 40s look like I did below with peep toe sandals, or try several inches above the knee with brightly-colored tights for a more modern take! 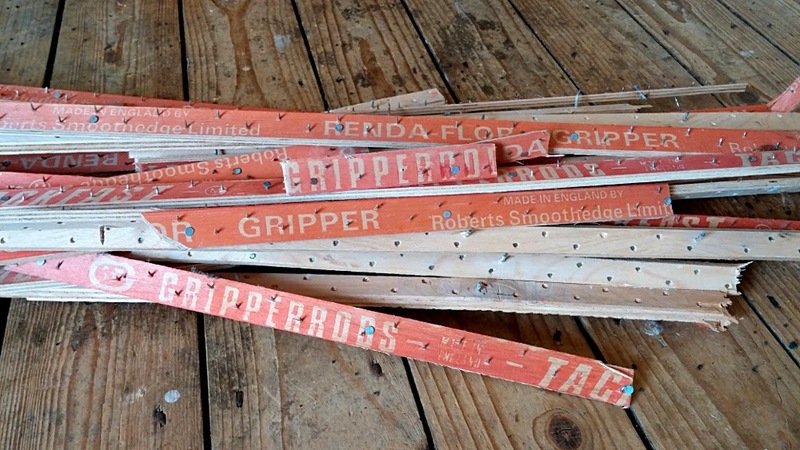 Now I know some people might be a bit gunshy about using vintage patterns. 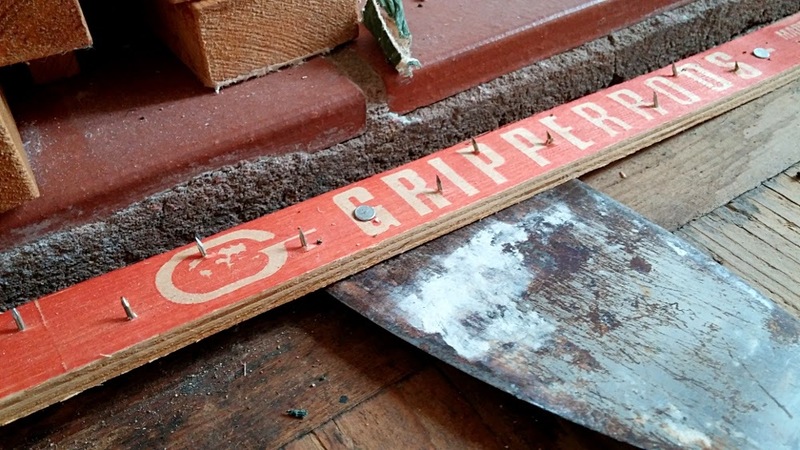 Maybe you've heard they tend to have short and pithy instructions, but fear not. Yes, a lace overlay wiggle dress with a shelf bra may not be the best starting point if you'd like to dabble in vintage patterns. So how about a 50s circle skirt, or a 70s mini dress, or a summery 40s dirndl skirt? 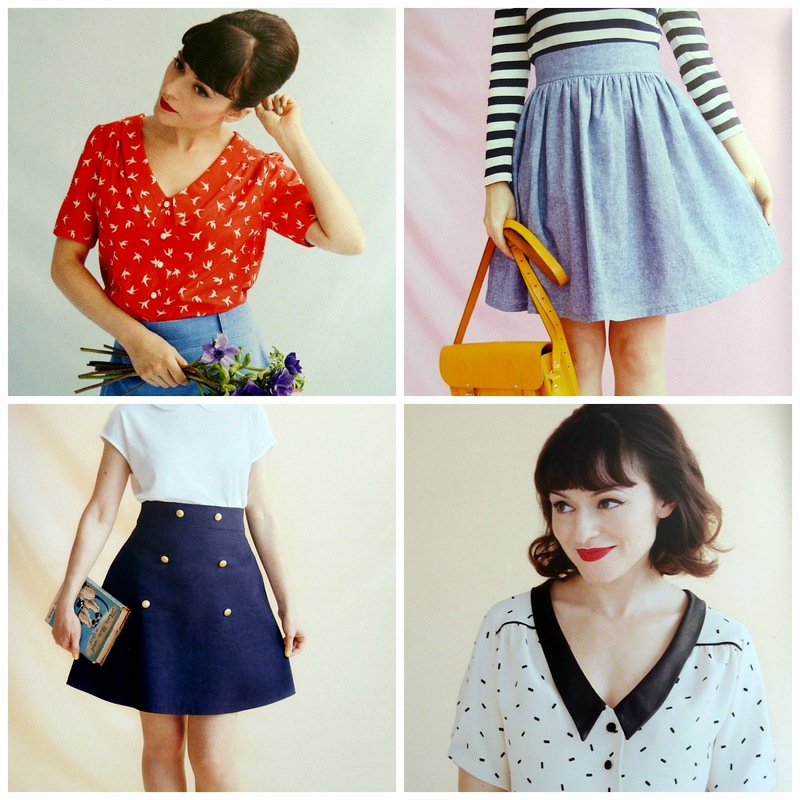 I cut my sewing teeth using vintage patterns and honestly, if I can do it, anyone can! 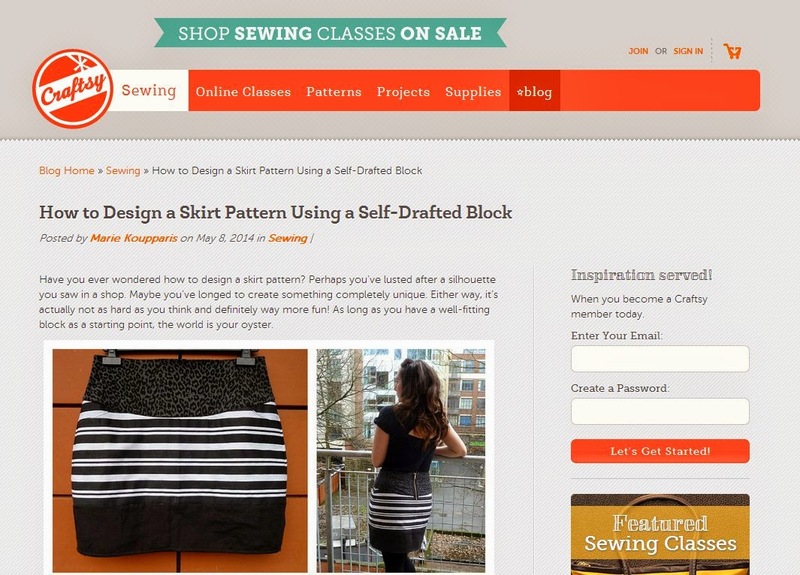 The best part is the online sewing community is amazing. 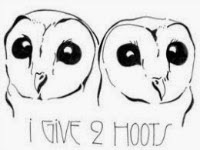 So many tutorials and helpful blog posts, and oodles of friendly and encouraging sewists to cheer you on. 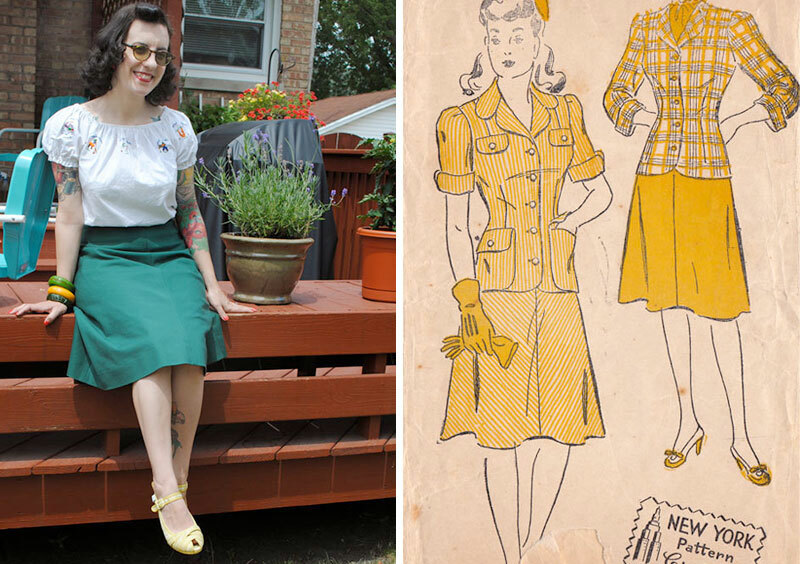 So go on, take Marie's Vintage Sewing Pattern Pledge! Join in all the fun. What are you waiting for?? Thanks so much for the inspiration and encouragement Tasha! 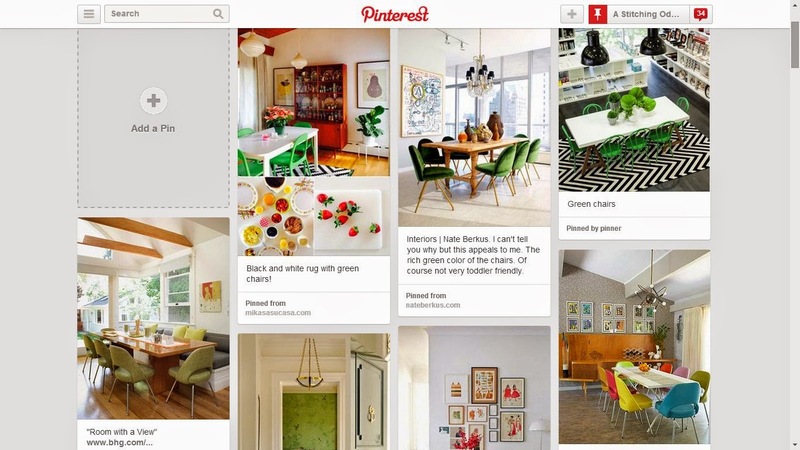 You can keep up to date with #vintagepledge on Twitter and Pinterest. Hello friends, I hope you've enjoyed the long bank holiday weekend if you're in England! 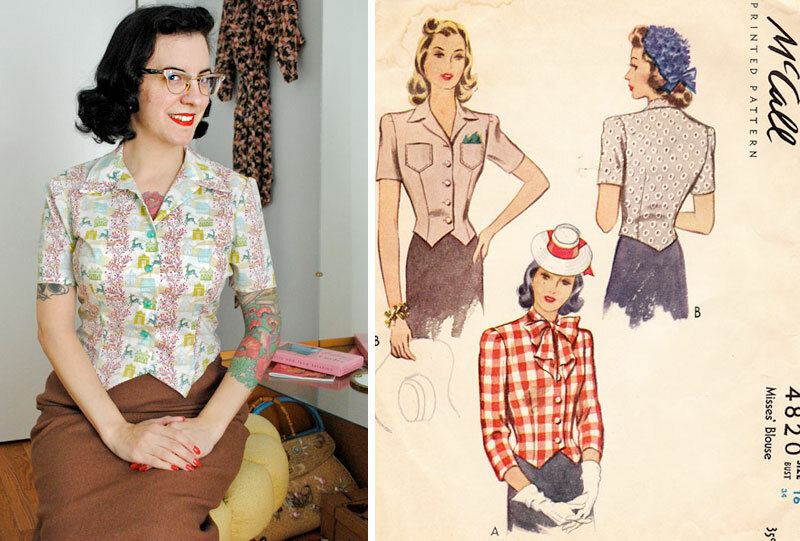 I wish every working week could be a short one, but not even the prospect of work can dampen my spirits today, because my Vintage Sewing Pattern Pledge is featured over at By Gum, By Golly! 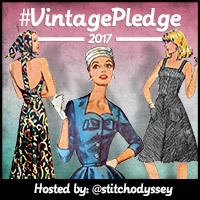 To have my little pledge supported by Tasha, one of my favourite vintage sewing and knitting icons, is really heart-warming. 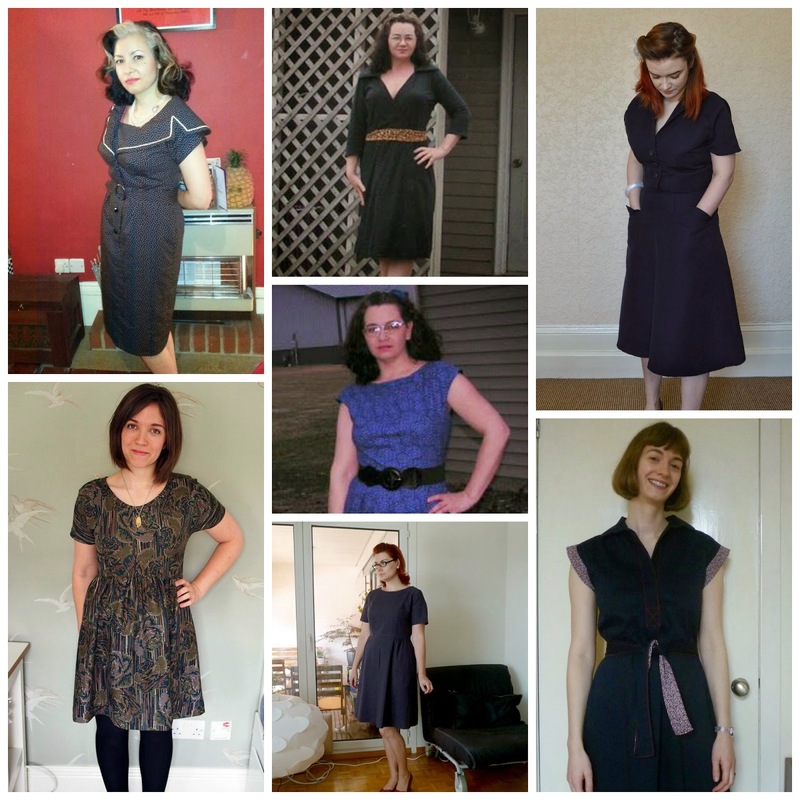 And if you tune in again tomorrow, I have a guest post from Tasha herself sharing her reasons for sewing vintage. Pretty exciting stuff, no? 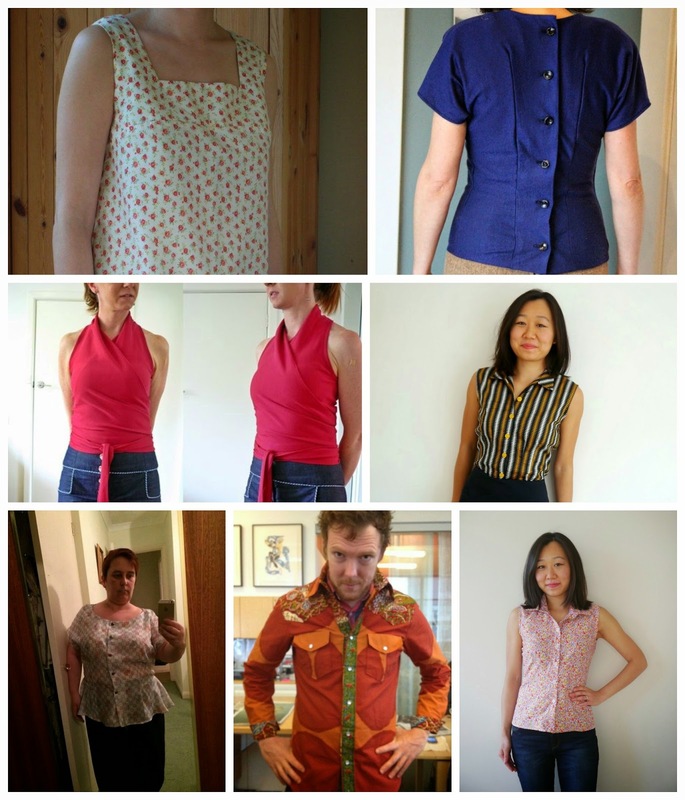 Speaking of exciting, there's well over 100 of you joining in with my Vintage Sewing Pattern Pledge and your beautiful projects are coming in thick and fast!!! 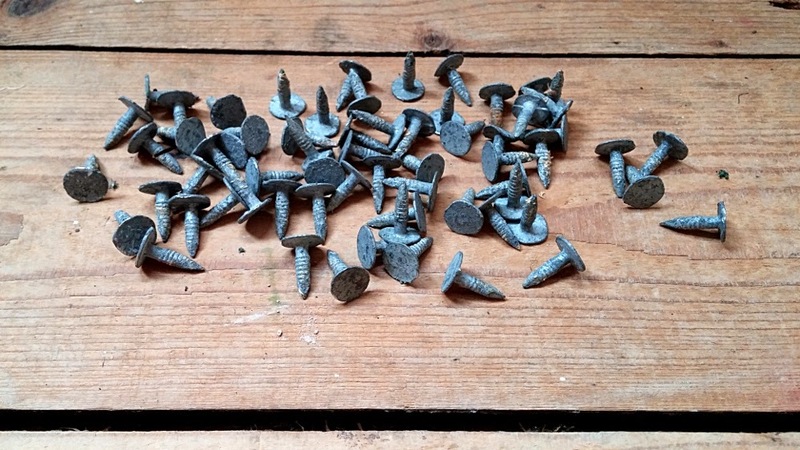 Check out my dedicated Pinterest board if you don't believe me. Because I'm so overwhelmed by your enthusiasm, here's a round-up of your makes (following on from my first one here), but do visit Pinterest for direct links to each project and blogger. Lots of chic, navy and black numbers! A special mention has to go to Fadanista for her nine makes to date!!! From the bottom of my heart, thank you all SO much for joining in! I look forward to see what else you come up with in the remaining eight months of the challenge...and to finally make a start on my own pledge of course! 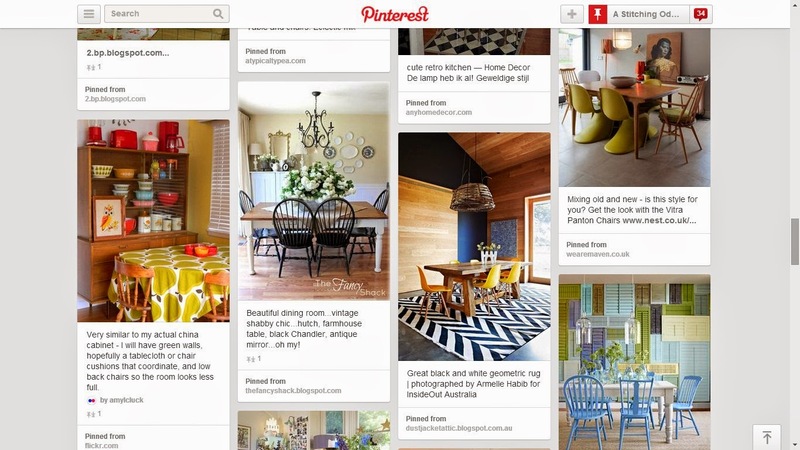 Keep up to date with #vintagepledge on Twitter and Pinterest.